HP entered the desktop computer business in 1968 with the introduction of the 9100. The 9100A was designed at HP Labs in California and manufactured in Loveland, Colorado. The 9100 was replaced by the 9810A in 1971. HP had only a single product offering until the 9820A and 9830A were introduced in 1972 to complement the 9810A. The 98XX machines shared many common internal parts. 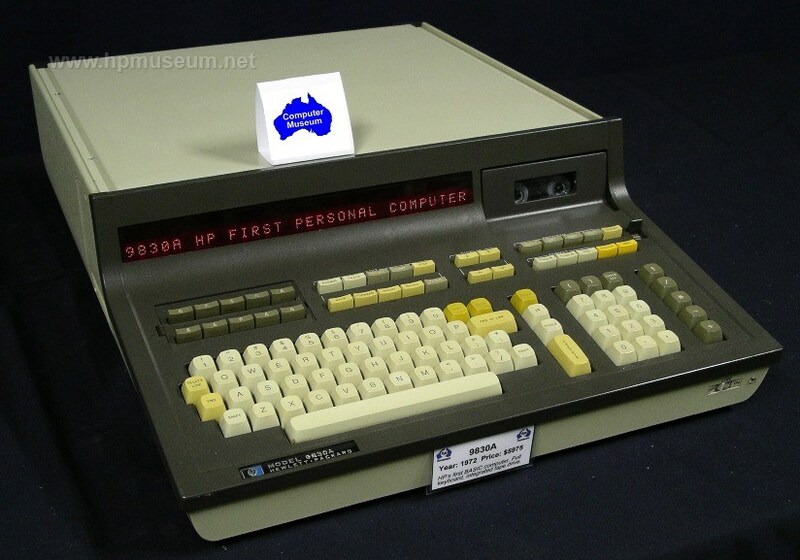 The 9830A came standard with BASIC language built in and is considered by many to be HP's first personal computer. It also included a single-line display, built in mass storage (cassette tape) with an optional thermal printer. The 9100 was an immediate success for HP as were its successors. These products spawned the development of HP's Loveland and Fort Collins Colorado divisions, which gave birth to many innovations in desktop technical computing in the 1970s and 1980s. These products were developed and manufactured at HP's Loveland Division. For more information on these products, be sure to sure to visit the Keyboard Magazine library. The museum has software for these old machines on magnetic cards and magnetic cassette tape. Click here for the software listing. Be sure to vist Steve Leibson's excellent site for more detailed information on the genesis of the 98X0 computers, www.hp9825.com.